"A satisfying dessert. 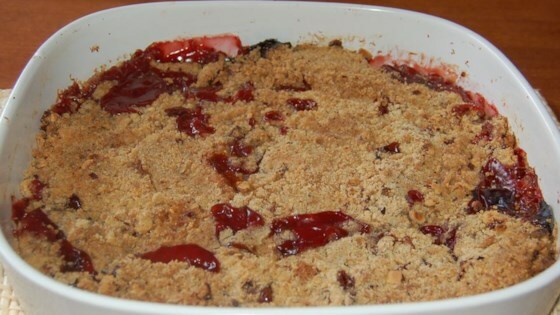 You can substitute apples for the rhubarb. Either is great with a scoop of ice cream!" In a large bowl, combine rhubarb, sugar, oats, 1 teaspoon flour, cinnamon and brown sugar. Stir until well combined and pour into prepared baking dish. Wonderful, making a 2nd batch. I added 1 full cup of oats. Made it just a bit thicker. This is awesome!!! Especially with a bit of vanilla ice cream! Too salty - The flavor gets lost in the topping.